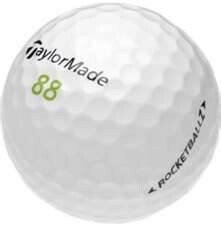 Taylormade Rocketballz are a current model ball selling in stores all around the country for up to $29.95 a dozen. Save huge dollars by purchasing from Lost Golf Balls. Taylormade Rocketballz are a premium 3 piece golf ball designed for maximum distance whilst having a high approach flight which encourages a softer roll and more spin. The soft Iothane cover produces great feel off the club, helping you with more responsiveness and touch with your short irons and putts.